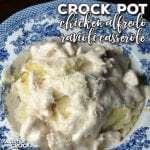 If you are looking for an easy recipe that kids and grown ups alike will love, this Crock Pot Chicken Alfredo Ravioli Casserole recipe is for you! Yum! I used boneless, skinless chicken thighs because they were on sale. You could also use chicken tenders (to speed up the process of cutting into bite size pieces) or chicken breasts. If you have the time and want to make your own alfredo sauce, I have a great recipe you can find here. If you need a speedier way of making this recipe, I love the Kroger brand alfredo sauce or Bertolli.